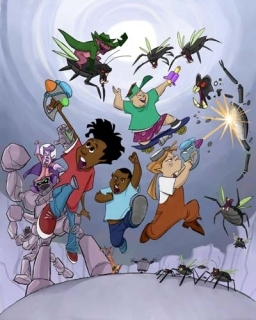 I've been searching the entire Internet for this show about 4 teenagers that enter a video game world where they have to fight monsters that looked like insects. Every time they had to enter the world, they'd go down in the sewers and one of the guys had a skateboard, a girl had a scooter and that's what I can remember. There was also one guy that always stayed behind to check their "health" in the game and pull them out in case they took too much damage to avoid them dying inside the game. I don't know if it was animated or not so there's not much to go on at all but hopefully someone might know what show it is? Jeremie Belpois, a gifted thirteen-year-old boy attending boarding school at the fictional Kadic Academy, one day discovers a quantum supercomputer in an abandoned factory near his school. Upon activating it, he discovers a virtual world called Lyoko with a young girl, Aelita, trapped inside it. Unusual events begin to occur at Kadic Academy. Jeremie learns of X.A.N.A., a rogue, malevolent artificial intelligence multi-agent system who also dwells within the supercomputer. X.A.N.A. 's goal is to conquer the real world and all human beings. Jeremie must materialize Aelita into the real world and stop X.A.N.A. Jeremie is aided by his three best friends and classmates Ulrich Stern, Odd Della Robbia, Yumi Ishiyama as they, along with Aelita, are virtualized into Lyoko in order to save both worlds from the sinister virtual entity. Because he is not very athletic and is more computer savvy, Jeremie rarely goes to Lyoko. When going to the factory, he rides a scooter. He's the main protagonist and also the youngest of the group. When going to the factory, she rides a scooter. The other three main characters all ride skateboards, also matching with part of the description of the show. 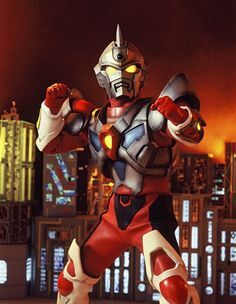 There was a show called VR Trooper. That was very similar to what you are describing. There were teens that had to enter a virtual world and fight evil. I believe it used to be on on a Saturday morning. If I remember correctly, and a quick check on IMDB will confirm/deny this, there were three that went in, a robot that could switch between the real and virtual worlds at will, and another kid that sat and worked the console, like an operator on the matrix. Da Boom Crew mostly matches your question. 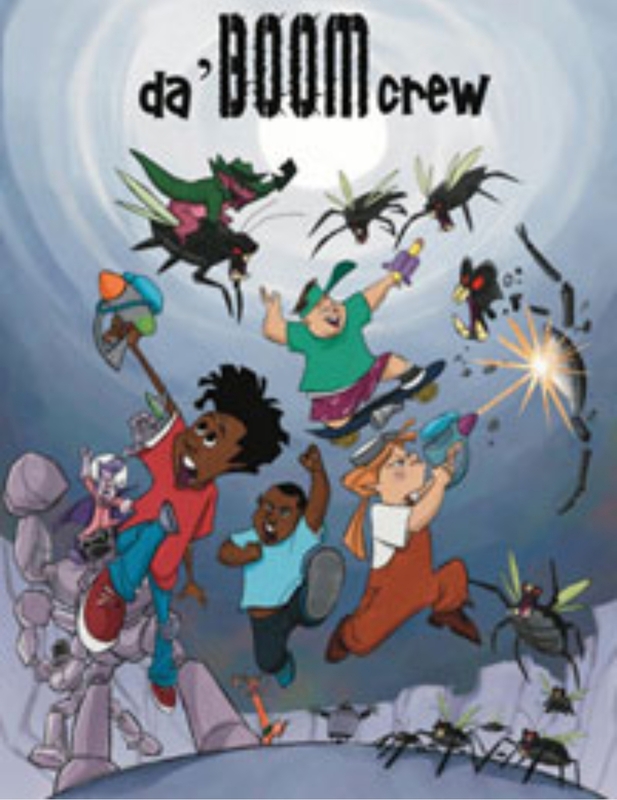 Da Boom Crew is a Canadian/American children's television animated series, produced by Berliner Film Company in association with Jambalaya Studios in Los Angeles, California. The series premiered on Kids' WB in September 2004. Unusual for an animated series, it was cancelled after only four episodes aired due to low ratings and viewer reception. In the United Kingdom, all 13 episodes were broadcast on Cartoon Network UK in 2005. After four foster children create a video game, suddenly a supernatural vortex appears and pulls them into a world which is really similar to their game. This show also details their adventures in this parallel world as they embark on a quest to find their missing game cartridges and stop the sadistic emperor extraterrestrial terrorist Zorch from taking control of this intergalactic dimension. As you can see from the title card for the show, one of the characters, Jubei, uses a "hoverboard" which resembles a skateboard, and some of the bad guys are indeed insectile. SpicyIce is a new contributor to this site. Take care in asking for clarification, commenting, and answering. Check out our Code of Conduct. What dystopian TV show has kids running an underground newspaper?